Photos sits firmly among the most beloved Google services, and although feature additions have been limited lately, they have been quite significant — like Live Albums. Two new options are beginning to show up in Photos now, though their rollout is starting in India and should expand to dozens of countries soon. The first new feature is Express backups, which Cody discovered in a teardown of the Photos app back in November. 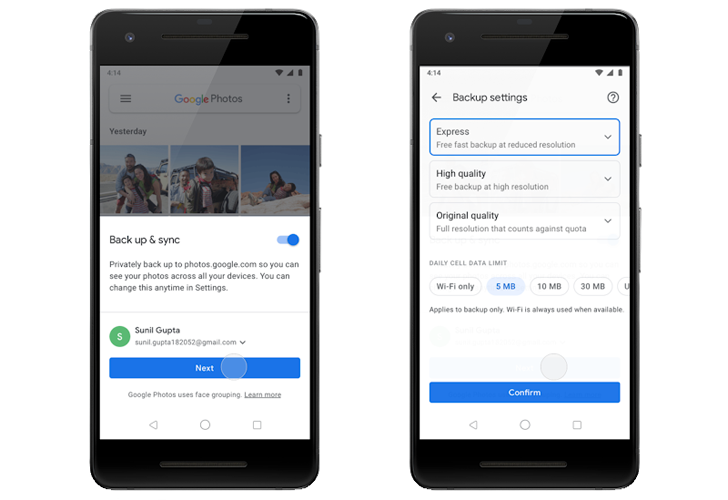 Instead of waiting for hours, even days, for a good connection to be able to upload your media, Photos will do a quick backup first at a reduced resolution, ensuring you don't lose your pics. You can still pick a regular backup option, either High quality (free, high res) or Original quality (full-res, counts against your Drive storage), for when a better connection is available. The second option is a data cap limit. Currently, you can either allow Photos to back up on a data connection or not, but with the new limits, you'll be able to choose how many MBs you allow it to use every day. Options are 5MB, 10MB, 30MB, and Unlimited, so you should find something there that works with your mobile plan allowance. Google says it started testing Express in India in December, but is now rolling it out widely and expects it to reach everyone on the latest version of Photos by the end of the week. It's also going to bring Express to dozens of other countries, but "slowly," so keep an eye out and let us know if you see it outside of India.